You're currently viewing posts by Pinsider essmeier. Trying to bring a game back from the dead (Gottlieb Big Top.) At power-up, nothing happens. 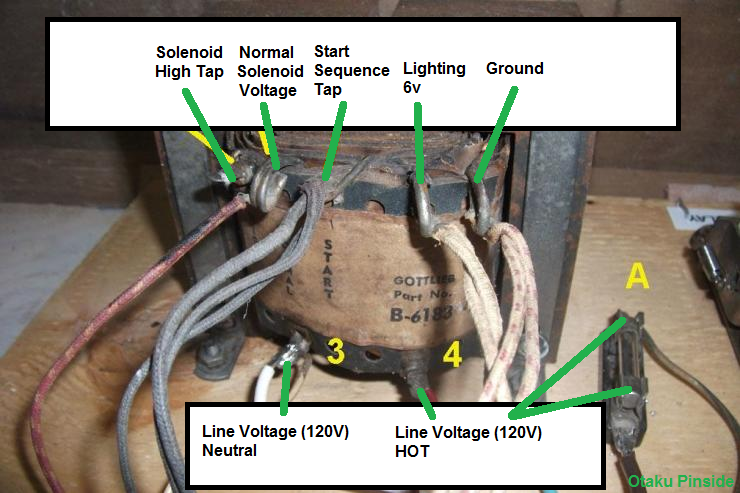 Before I do anything else, I want to check the transformer, but the labeling on this one has me a bit confused, so I'm not sure what voltages I should be seeing or where I should be seeing them. This particular transformer doesn't have everything labeled, so I'm not sure what's what. On the top, I've got terminals labeled "High," "Normal," and "Start," along with two terminal that are not labeled. On the bottom, I've got two terminals that are not labeled. The one that I've noted as "3" in the attached image has a line from the power cord coming into it. I need to test the output voltages, but I'm not sure where to put the leads. Is the lug labeled "start" the one that's often labeled "common?" 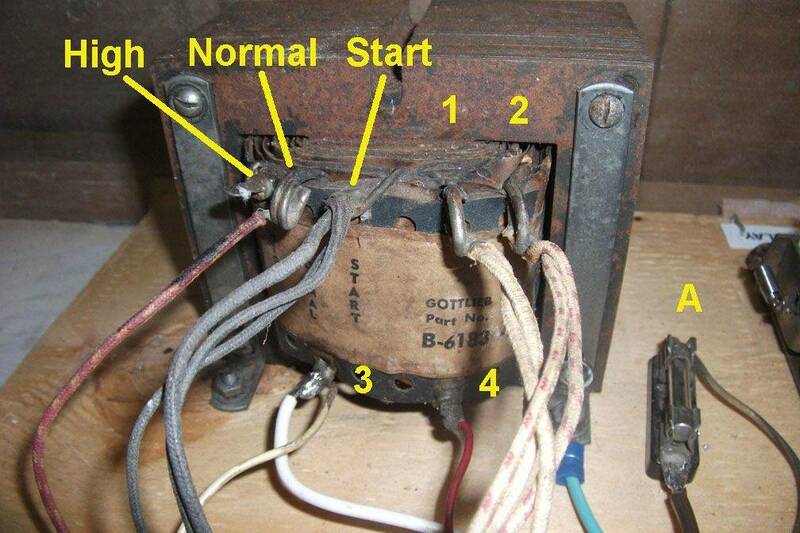 I AM getting 110 volts between "3" on the transformer and "A" on the fuse, so our fuse, cord and power switch are good. In my previous EM adventures, I've rarely needed to deal with transformers at all, and when I have, everything's been labeled. I should be able to see three voltages - 110 volts (input), 6 volts, and 24 volts (output). Between which points should I be checking to see those voltages? "A multimeter will answer all your questions. Establish a ground and your meter will give the voltages." My questions concerned where to put the leads from the multimeter in order to test the respective voltages as half of the lugs on the transformer aren't marked. So, points "4" and "A" on my image should be common, as they both represent "hot" line voltage, right? If I'm reading 110 volts between points 3 and A, shouldn't I also be reading 110 volts between points 3 and 4? I'm concerned that I may not be getting 110 volts at the input side of the transformer, perhaps due to a problem somewhere between the fuse and the transformer. I'm seeing 0 volts between points 3 and 4. If I'm reading the schematic correctly, the "red" wire at point 4 first has to go through the shutoff switch, the bounce switch the anti-cheat switch on the coin door and a switch on the start relay, though that switch shows as normally open. Not sure what's happening (or not) here. I'd think so, but I'm not measuring voltage between 3 and 4 on my Slick Chick either, and that game works. Look at the schematic and match up the wire colors. Not much help on a 50 year old game where nearly every wire is the same color. Don't mean to be silly but, is the games power switch on? Previously addressed, but yes, it's on. I'm getting power through the switch and through the fuse, but beyond that, it doesn't seem to be getting to the transformer. The shutoff switch, anti-cheat switch and bounce switch are all closed, so I'm not sure where the hangup might be. 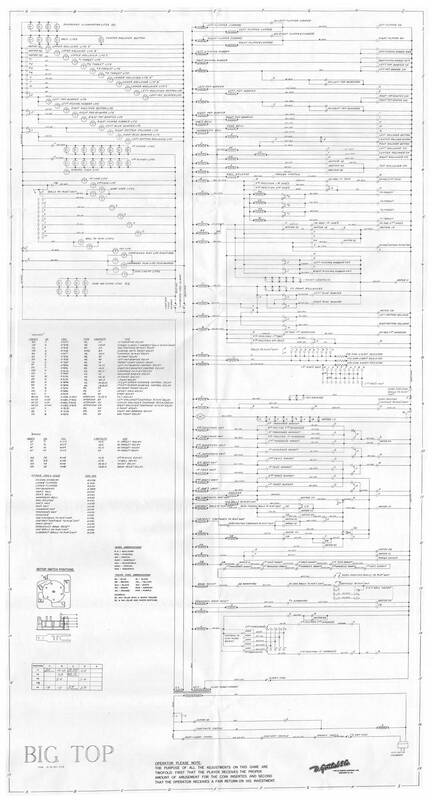 I've attached a copy of the schematic in case anyone feels like having a look. Transformer is now known to be good. The anti-cheat switch on the coin door appeared to be closed, but wasn't. That was preventing power from getting to the transformer. I've adjusted the switch so it is not closed. The machine won't start a game when I press the coin switch, but when I pressed the start relay, the score motor began to turn (continuously) and all the lights on the playfield and the head came on. The score reels make no attempt to reset. I have labeled my relays; none of them were labeled when I received the game. My restoration of this game is a story for another thread, and I'll share that after I get it working. There isn't a single component on this machine that hasn't been completely disassembled, so I've likely got 50 problems to solve before it will play a game. For now, at least I know I have power. Now that it's powered up, I'm having trouble figuring out the startup sequence and I've got questions about the score motor.